The Partners System allows third parties to create listings for your website as well as update their Recommended Professional and contact information without needing access to your admin panel. To create or manage Partners, click on the Partners section of your admin panel and select Partners. The Partners overview section will allow you to create new partners, edit or delete existing partners, access the Partner System, manage partner permissions, and send Partners their login information. 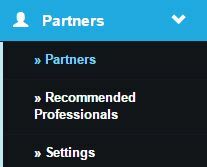 at the top of the Partner Overview page. Click the Edit button under the actions column to edit an existing Partner. You will need to complete the below fields to add a new Partner. The Username should be the Partner's Email Address. Passwords must include at least 1 number, 1 capital letter, and be at least 8 characters long. If you link a Partner to a Contact or a Recommended Professional, they will be able to update their own information for these respective profiles through the Partner System. If you choose to link a Contact or Recommended Professional profile to the Partner account, additional fields will be populated. If you select an existing contact, information contained in those profiles will be automatically completed. You can enter information into any incomplete fields at this time or simply save the Partner account. button at the bottom of the page. Once you have created a Partner, you will be able to update their Permissions. Partner Permissions can be accessed from the Partner Overview section by clicking on the Permissions button under the actions column. If you are editing a Partner's profile, you can also use the Permissions and Additional Info button at the top of the page. Partners with the Real Estate Marketplace Role will be able create listings for your website. Listings created through the Partner System are also added to your Admin Panel. If the Publish option is set to Yes, Partners will be able to upload listings directly to your website. If they do not have permission to publish listings, the listings they create will be added to your Admin Panel for your approval. You can also set a monthly limit for the number of listings a Partner can create. 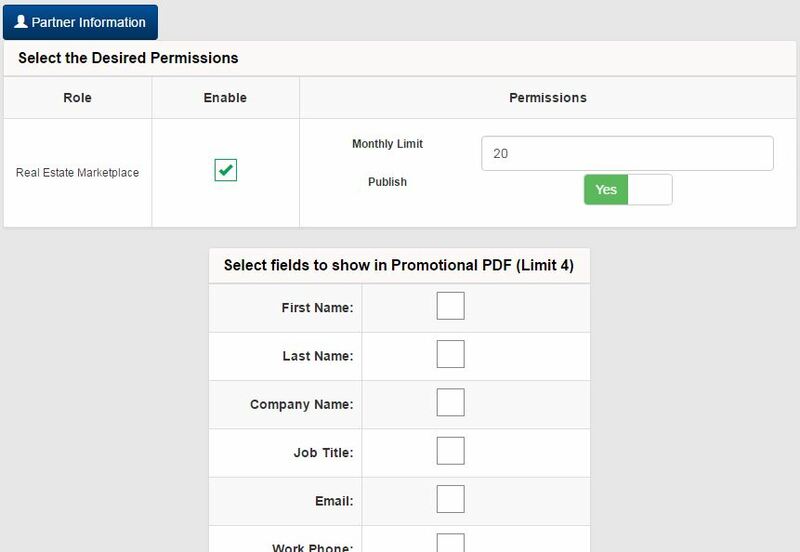 You can also select fields to show in the Promotional PDF. These are fields associated with the Partner's Profile and will be displayed in the footer. This information will override any existing footer information with the exception of the logo selected in the Marketplace settings. To send a new Partner their login information you can click the icon in the Partner Overview section. You can also click the Send Login Information button at the top of the page when editing a Partner's information.